Being a server at a restaurant can leave you with sore feet from running around all day. But it doesn’t have to! We’ve compiled a list of the best work shoes for servers because you deserve to be comfortable at your job. Before we get started looking at the shoes, here are some things you should keep in mind while you’re shopping. Afterward, check out all of the amazing shoes that we found. Upper Material: The upper material is what the main body of the shoe is made of. Most of the shoes on this list are made of leather, but some are made of super lightweight EVA foam instead. Gender: How do the sizes run? Unisex shoes usually list sizes for both genders, but when you want to buy a shoe that’s made for the opposite gender you must know how to compare your sizes. 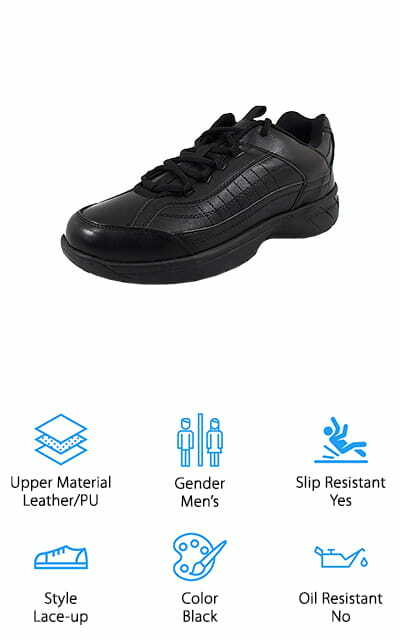 Slip Resistant: Slip-resistant shoes will make sure that you stay on your feet even on the slickest of floors. This is a useful feature when you’re going to be ducking into the kitchen at a restaurant. Style: There are a few different styles of work shoes, from slip-ons, clogs (which are a special type of wide-toed slip-ons), to the normal lace-up shoes that you’d expect. It’s up to you which you want to wear! Color: What color are the shoes? Most of the shoes that are specifically branded for servers are in black, as that is the most universally compatible color with multiple different restaurant uniforms. Some even come in brown! Oil Resistant: Oil-resistant shoes won’t stain or slip when introduced to oil. Some shoes will remain slick if they’ve been introduced to oil even if it’s been cleaned off, so look for this if your workspace is frequently oily. Now we can take a look at the top ten shoes for restaurant servers. We’ve done all of the research and review in order to bring you only the best shoes for your particular job. We want you to be comfortable while you’re serving others! Our top pick and budget pick are highlights, so check them out before you look through the rest of the list. We know you’ll find your new favorite shoes. KEEN’s Utility work shoes are made for men and slip right onto your feet so you don’t have to bother with laces. They are the best black shoes for servers on our list because they are made with the highest-quality materials. 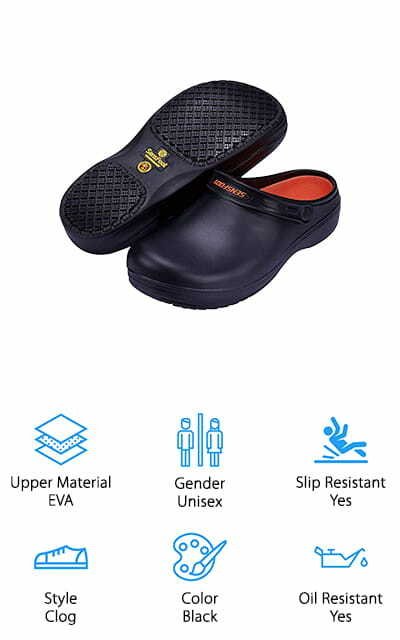 They are oil and slip resistant and made of comfortable PU, cork, and memory foam that helps to contour to your feet and keep you comfortable during long days on the job. The EVA midsole is compression molded so you get the most comfort that you can. What makes these shoes unique is the way that the toes are made, with the outsole wrapping over the toes for the ultimate protection against drops and spills. 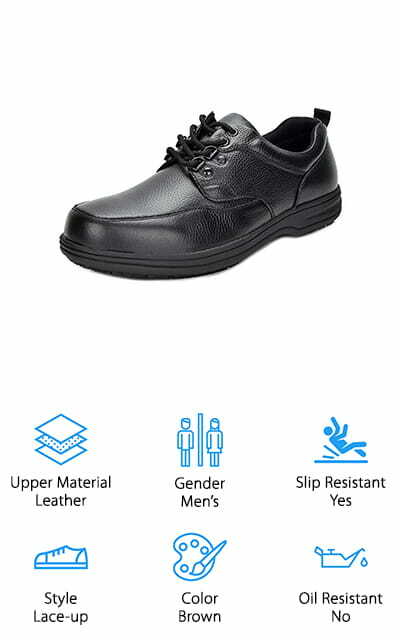 These shoes are made of 100% leather, with elastic gore panels and rubber soles to keep you on your feet even in the slipperiest of work conditions. They have a TPU stability shank for support, too! You’re going to love them! Laforst makes these Eamon Slip-Resistant shoes. They are some of the best affordable shoes we could find that would benefit servers through a day on their feet. These shoes are lace-up, but that’s contrasted with the fact that you don’t really feel them on your feet. They are extremely lightweight shoes that won’t impact your ability to go through your day. The uppers are made of leather and PU so that they always look like they’re brand new while still being resistant to water and abrasions. The sole is rubber and PU, which makes these the best non-slip shoes for servers on our list. You can go through the toughest of conditions and stay on your feet. Plus, the inside boasts a memory foam insole so that you’re extremely comfortable during your shift. These lightweight, gripping shoes are a must-have for any server that needs something comfortable but inexpensive. They have a half-inch platform, too. These SensFoot Clog shoes are great for any position in the foodservice industry, from chefs to servers. 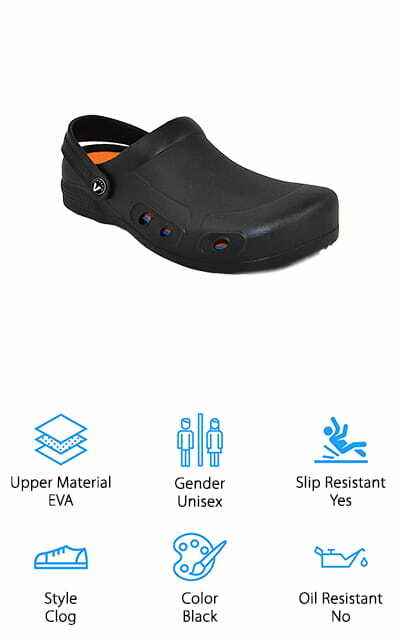 They are made of EVA foam that is comfortable and flexible, with a non-slip rubber sole. The EVA on the upper is oil resistant so that you can safely do your job even when you’re ducking into the kitchen. These shoes were specifically designed for chefs and nurses, so they include a lot of features that are going to make your feet happy even after all the time you’ve spent on them. Plus, it makes your shoes super lightweight, with each weighing less than 0.6 pounds. You’ll hardly even feel them on your feet, which is especially useful with long-serving shifts. They are also extremely slip-resistant, meeting the highest standards required for the healthcare and service industries. The EVA materials are also environmentally friendly, so you can rest assured that you’re helping the environment by wearing these shoes. Emeril Lagasse has made several different iterations on food service shoes, but this is one of his greatest creations. These slip-on shoes are black, of course, so they’ll match your work uniform. They’re also oil resistant and slip resistant so you can use them to serve or you can use them while you’re cooking. They have a 100% leather upper and a synthetic sole to help them grip the floor. Inside, there’s a B.A.M memory foam insole that will conform to your foot and give you 24-hour comfort. The EVA midsole gives you the best support available for your entire foot. The entire shoe works to repel all manner of food and liquid, so they won’t soak in or stain. Plus, it comes with a breathable lining to help reduce odor and keep the shoe fresh by wicking away moisture as it forms. These really are some of the best shoes for servers and food service workers. Dickies is a great brand that has created great, durable work attire over the years. These shoes fit right into their lineup. They are made of 100% leather, with a durable rubber sole that will keep you from sliding around the kitchen. They are slip-resistant and oil resistant. These shoes slip right on your feet without the complication of ties that might come undone during your shift. They also come with a padded tongue and collar for added comfort and to prevent blisters entirely. They have elastic gore openings at the side for airflow and a moisture-wicking fabric lining that you’re going to love. Keep your shoes dry on the inside and the outside with the channeled outsole that helps to keep liquid from getting between your shoe and the surface of the floor. When you want comfortable, effective shoes, go with Dickies. The memory foam will keep your feet comfortable throughout your entire shift. 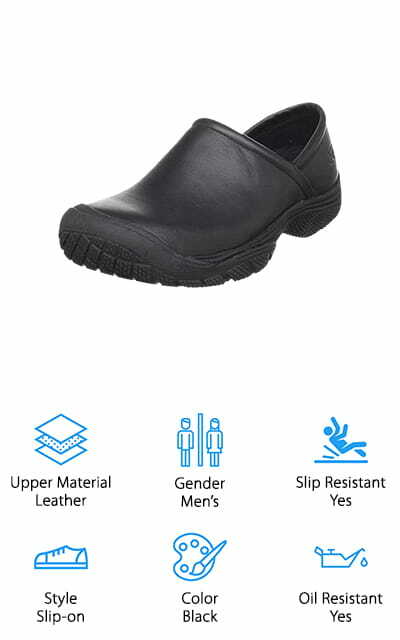 These Fanture clogs are made specifically for work in a food service environment. 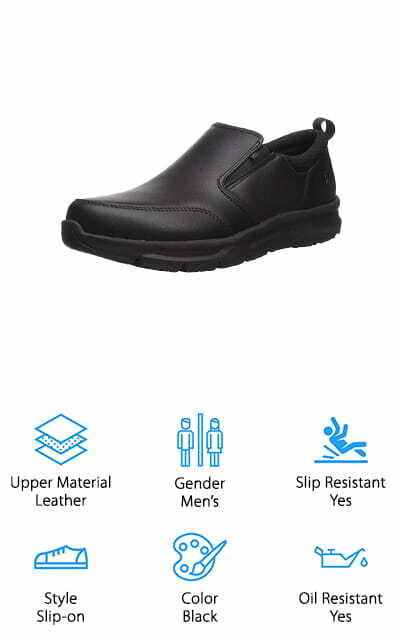 They have a slip-resistant rubber sole, designed with a safety sole feature to double down on the amount of safety that you get while walking around in your workplace. The uppers are made of EVA, meaning that the shoe overall is very lightweight and easy to move around in. They are comfortable and support anyone who has to spend a lot of time on their feet. The clog design is great for just about any occasion, whether you’re going to the beach or redoing your garden. The enclosed toe-cap is made with extra-dense EVA to give you a thicker protective layer against accidental drops in the kitchen. The insole is comfortable and breathable, to make sure that you stay comfortable and dry while you’re on your feet all day. As an added bonus, they are unisex, so they are fit for both men and women! VANGELO makes these amazing unisex chef shoes. They are slip-resistant, perfect for working on slick surfaces. The outsoles and bottom soles have a very specific design to channel fluids away from the place where your shoe meets the surface of the floor. It also has an anti-microbial function, allowing you to wash the entire shoe to keep it clean when you need to. The body is made of lightweight EVA foam, which is both supportive and gives you the ability to move around easily. You can use your favorite Ortholite removable insoles with these shoes, giving you that extra bit of comfort when you’re on your feet all day anyway. If you wear a half-size, they recommend getting one size up for a better fit. 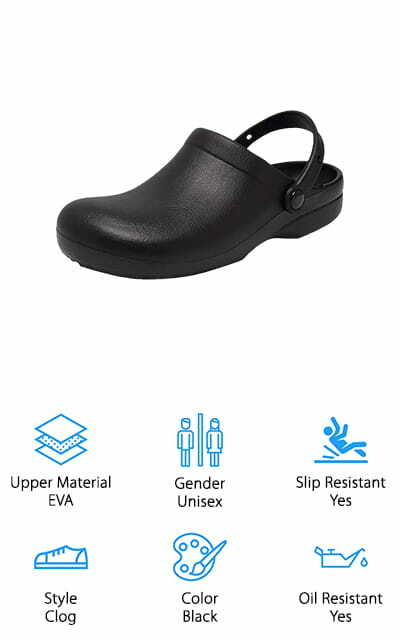 For any server that needs rubber-soled, slip-resistant footwear, try these amazing clogs that you can wear just about anywhere. They make sizes for both men and women so you’ll always get the perfect fit. 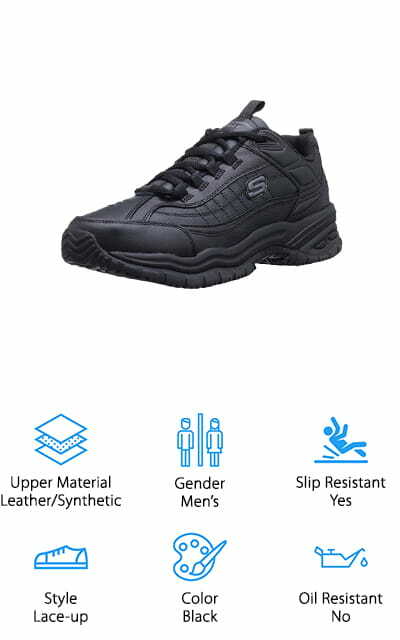 Skechers is one of the most popular affordable shoe brands, and when it comes to the best work shoes for servers, they definitely access. This is a mid-top, sneaker-inspired boot with a composite toe for amazing toe protection. The upper panels are made of Ripstop nylon to help keep them looking great even after you’ve worn them a lot. The uppers are leather, with a comfortable lace-up design so you can choose how tightly you want to secure them. 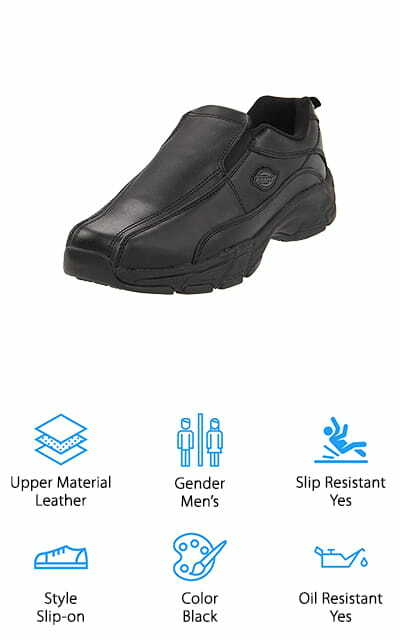 These shoes come with removable PU insoles and a slip-resistant rubber outsole that is compliant with all OSHA laws. You can use them for more than just serving work! These shoes are durable as well as comfortable, and the composite toe gives you that extra bit of toe protection that will keep them safe. These are great shoes if you aren’t a fan of the clog or slip-on style, but prefer to keep them tightly secured to your feet. Dream Pairs makes these super-stylish men’s work shoes. They look exactly like a pair of business oxfords, to give you the perfect blend of professional look and a casual, comfortable feel that is perfect for work. They have a rounded-toe design so that your toes won’t rub while you’re walking around. The upper is made of genuine leather so they look and feel great. The footbed is a man-made, cushioned construction that feels comfortable on your tired feet. There are different colors to choose from, all variations of black and brow, so you can choose the color that best matches your uniform and still be comfortable. Your feet will love these shoes, and you’re going to love how comfortable they are, and how great they make your feet feel after being on them all day. 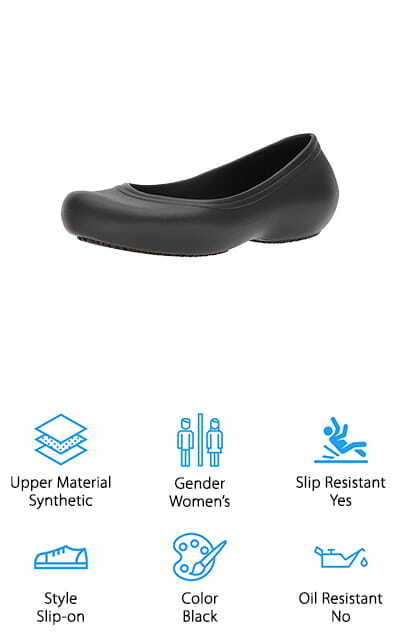 They are also slip-resistant, so you won’t be sliding around the kitchen. These shoes are a pretty amazing package, to be sure! Crocs are, of course, world-renown shoes that people everywhere enjoy. Now they make work shoes! With their Crocs at Work line, they’re taking their casual feel and placing it in your workplace. These flats are good shoes for servers, and unlike regular flats, they won’t leave your feet feeling tired and sore. They include a foam cushion to make it more comfortable to walk around on all day. The slip-resistant outer tread is designed specifically for hospitality workers. These flats are stylish and versatile, with all of the features that you would expect from work shoes. At the back, the heels are cut out for optimal airflow, so your feet don’t end up sweaty even at the end of the day. Nothing quite beats these comfortable Crocs for all of your work needs! If you wear a half-size, they recommend ordering the next size down for optimum comfort and a great fit to last you all day long.